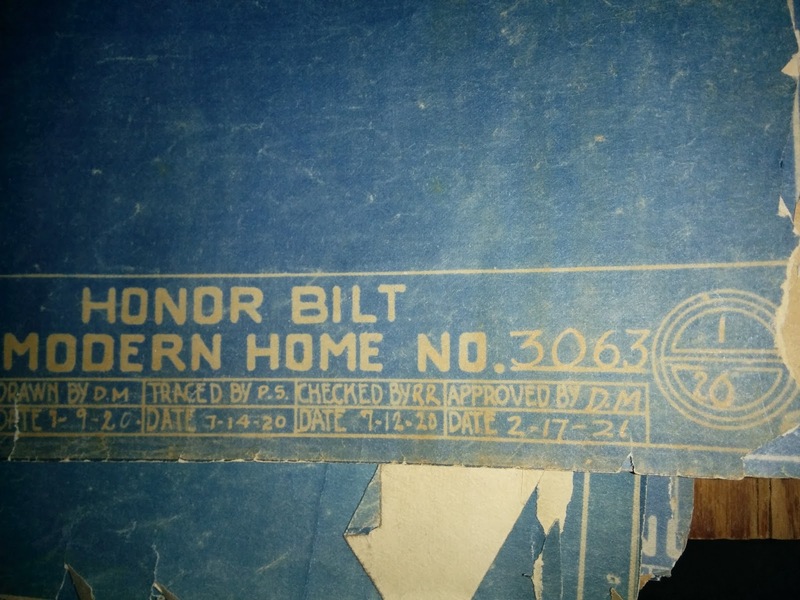 It is unusual for an owner of a Sears house to have proof of its provenance--that is, hard evidence that the house originated from a catalog. After 90-100 years, typically all paperwork and receipts from Sears have been lost or discarded. There is a Sears Americus currently for sale in Lafayette, Indiana, that comes with the original blueprints, materials lists, and correspondence from Sears. Thanks to homeowner Ryan Russell and his girlfriend Gene Ann Fausett, I am able to share this rare documentation with you! A twilight shot of 23 N 19th St, Lafayette, Indiana. The house in Lafayette has a reversed floor plan from the catalog image. Typically, Sears would not charge extra to provide reversed plans. Previous owners installed the aluminium siding and removed the decorative rafter tails. 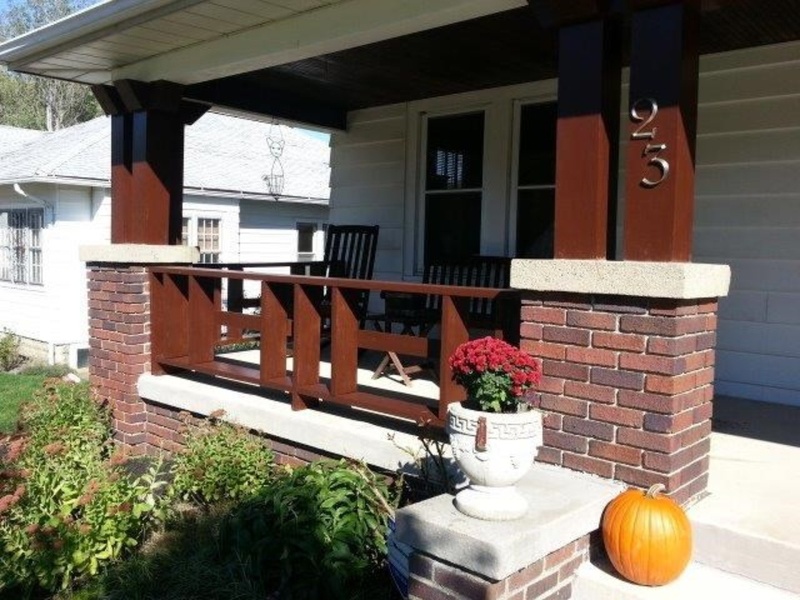 The original Sears porch supports are intact. A previous owner had installed a wrought iron railing. Ryan and Gene Ann recreated the decorative wood railing from blueprints they found. When Gene Ann was stripping old paint from the porch supports, she found that they were stamped with an alphanumeric code by Sears. The living room. 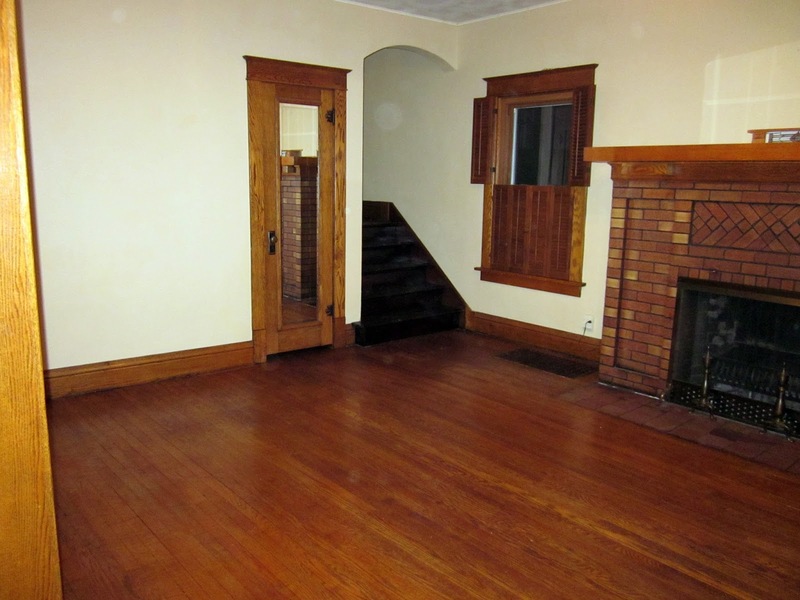 That's the coat closet to the left of the staircase. 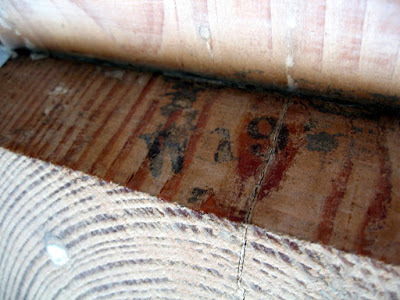 More marked lumber under the basement stairs. Ryan and Gene Ann have two sets of blueprints. Since the floor plan was reversed, the Sears Modern Homes Department sent both a standard set and a reversed set. 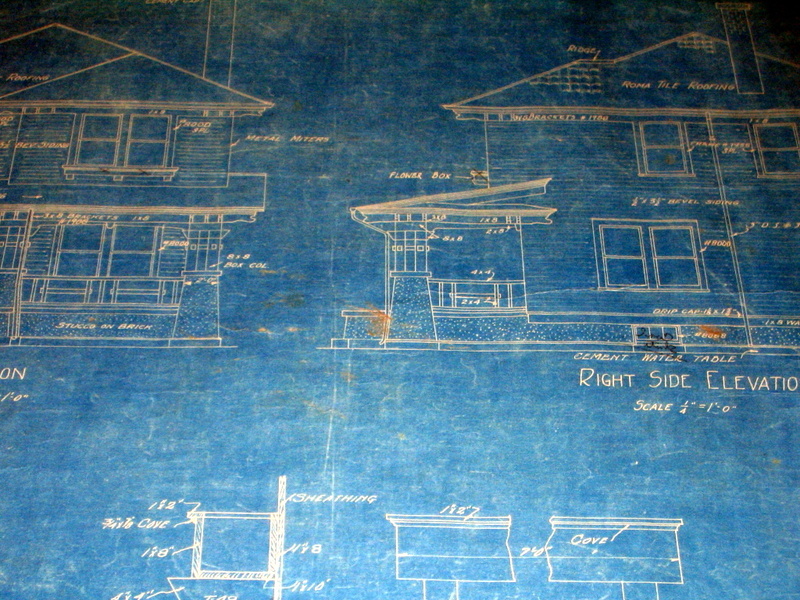 Shot of the blueprints. You'll notice that someone drew X's through the flower boxes! Who was D.M. who drew the Americus plans in 1920? I suspect it might be David Mahaffey, a Chicago architect. The original purchaser of the house was Harvey Sellers. In 1920, Harvey worked as a bookkeeper at the Journal Courier Publishing Company, and eventually he became Treasurer. 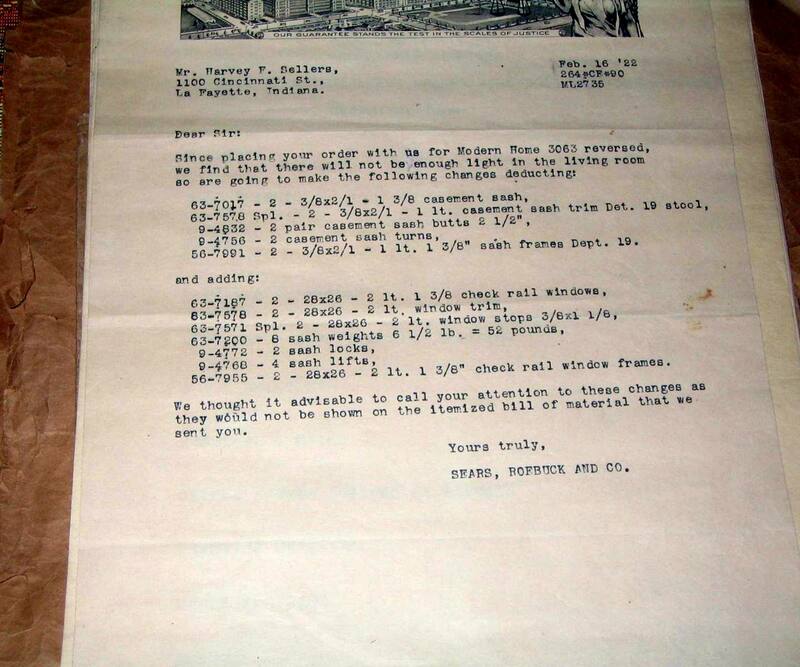 Harvey purchased the house in February 1922 and he married wife Freda in May of that year. 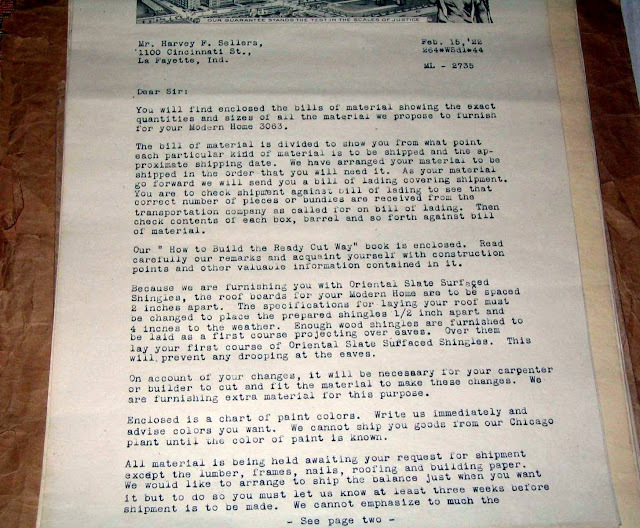 Letter to Harvey dated February 1922. 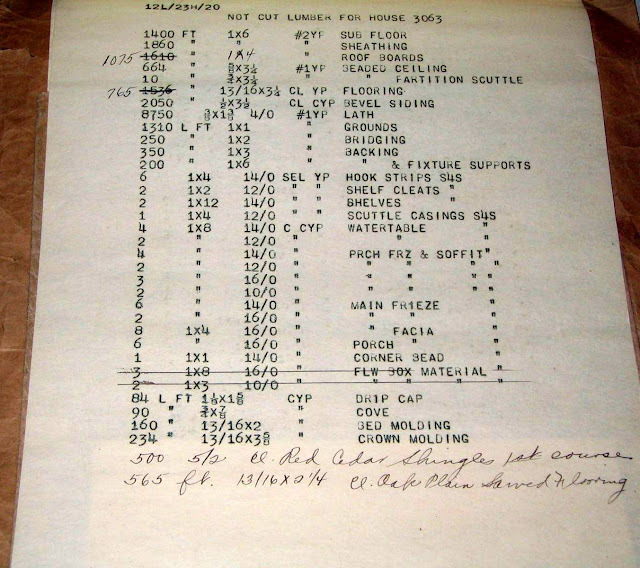 Sears had enclosed the bill of materials, the How to Build the Ready Cut Way instruction book, and a chart of paint colors. Because Harvey purchased the "Oriental Slate Surfaced Shingles", he had to modify the roof construction to accommodate the extra weight. Page two of the letter. 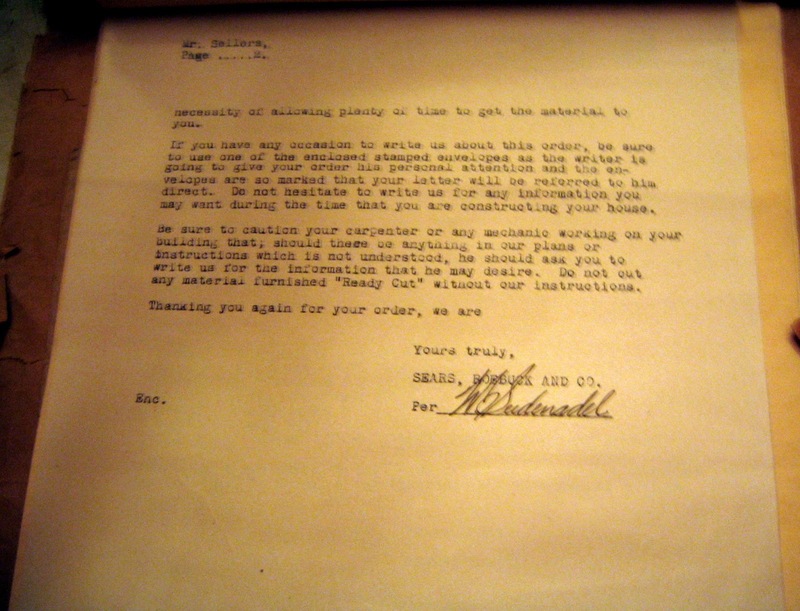 Sears warns not to cut any material marked as "Ready Cut"! Sears included a second letter that outlined changes made to the bill of materials that was sent. Harvey had added a fireplace to the standard model. 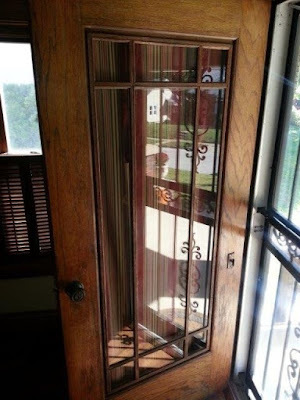 Consequently, Sears felt that there would not be enough light in the living room and swapped out the standard windows. I was surprised that Sears was this proactive about making changes to the design on behalf of the buyer. 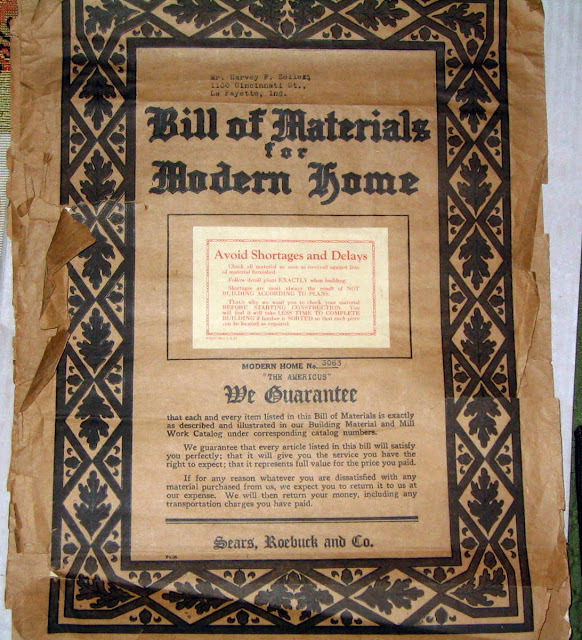 Cover of the bill of materials. The summary of the materials and the total price: $2359.50. A more comprehensive list. Note that the lumber wasn't ready cut. Maybe Harvey did this to keep the costs down. 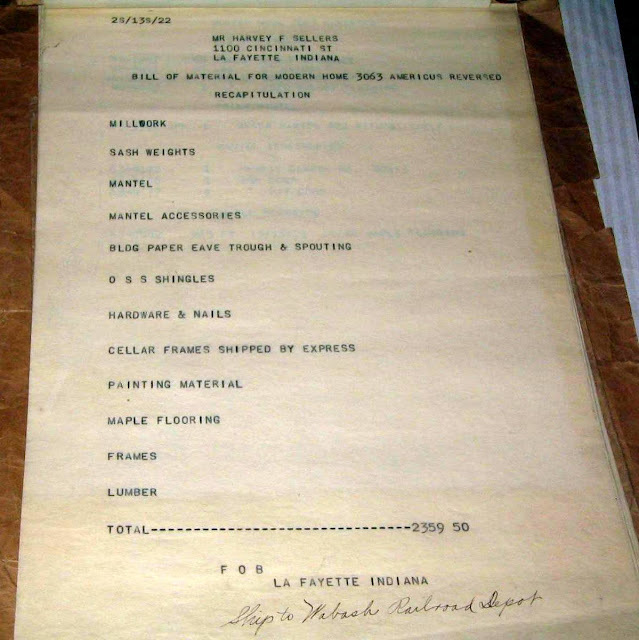 Note the flower boxes crossed out on this sheet. Harvey was anti-flower. 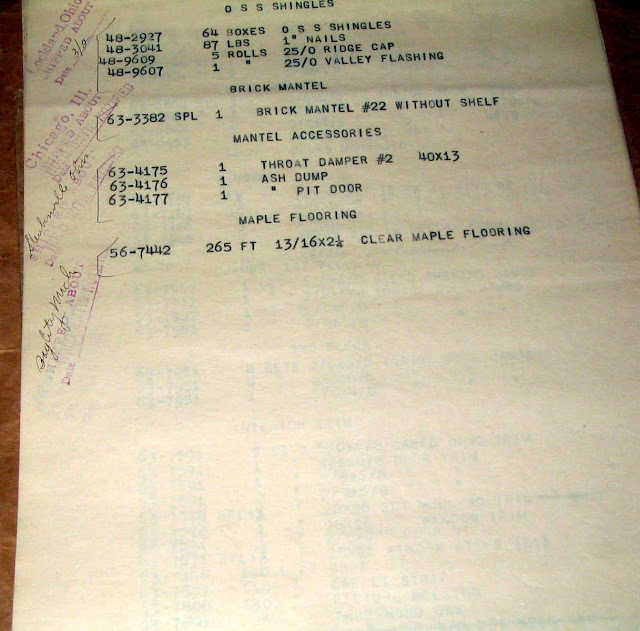 More materials, with detail about the locations from which they would be shipped. The roofing materials were shipped from Lockland, Ohio, The brick mantel was shipped from Chicago. 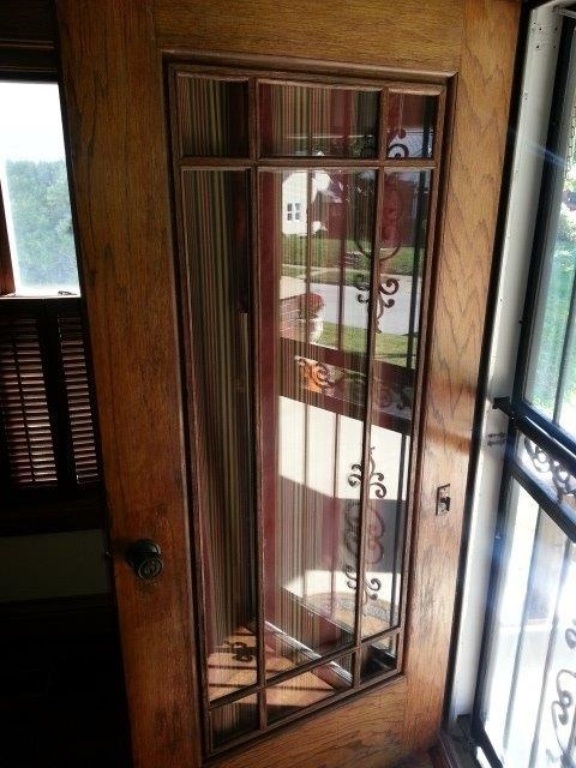 The metal fireplace hardware was shipped from Steubenville, Ohio. The maple flooring was shipped from Bay City, Michigan. After 30 years of marriage, Harvey died in 1952. 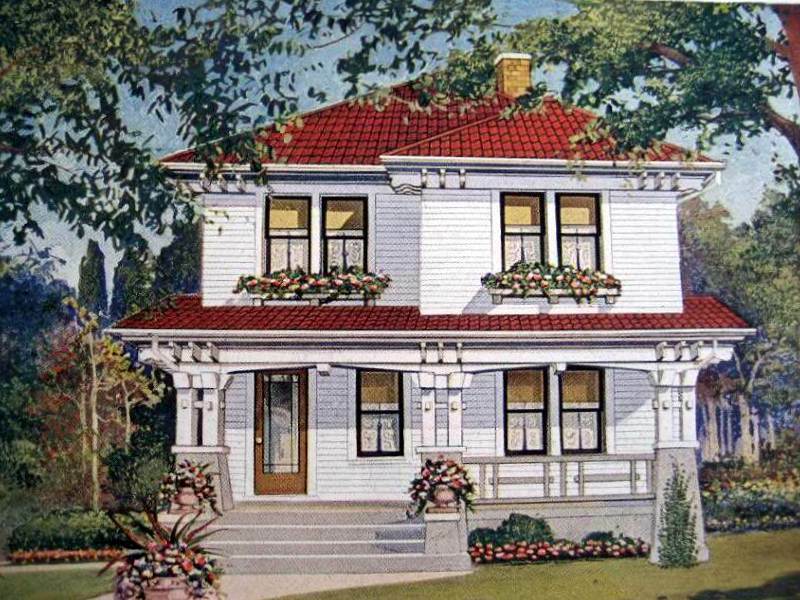 Freda continued to live in the house until 1955. Ryan is only the third owner of the Americus, and he's been there since 2003. All the paperwork and blueprints have been stored away while the house is being shown to buyers. 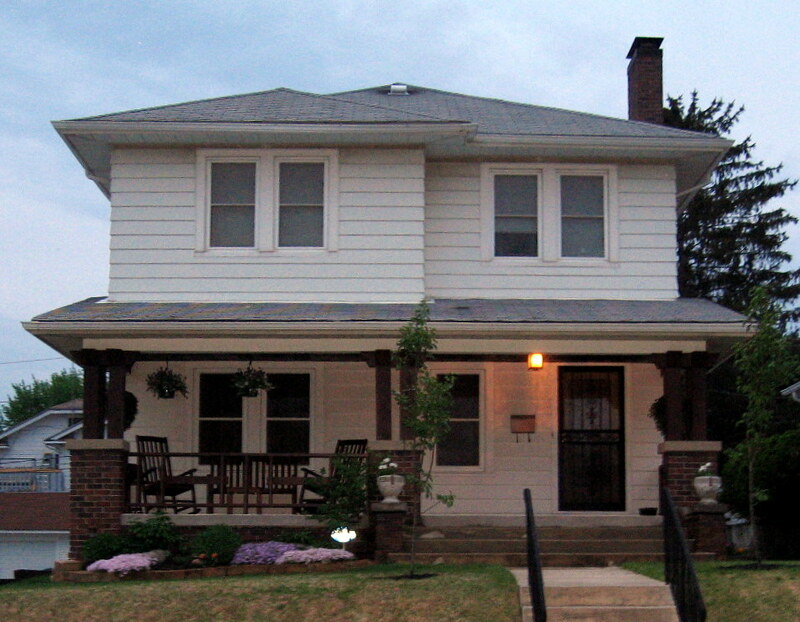 Gene Ann wrote in an email, "I fell in love with the house because of its character and history. ... It was one of the best made houses I have ever lived in. It was very quiet even though it is in the middle of the city. ... It would be peace of mind to pass it on to an enthusiast." The house is under contract. Oh my gosh! What a treasure to have all those bills! I used to live in Lafayette! In the late 1970's of course, when nobody knew squat about kit houses. Except National Homes, of course, as their headquarters and production facility was there and busy for years. Very cool house! I've probably admired it, and had no idea. There are lots of Sears houses in Lafayette, I betcha. Shari, I bet there are a lot in Lafayette too. With very little effort, we already have logged 15 in the database in Lafayette and five or so in West Lafayette.